Product Consists: Decorative Stainless Steel Thali, Home Made Chocolate (Weight: 10 gms), Kaju Katli Sweet (Weight: 200 gms), Traditional Rakhi, Roli Chawal along with Goodies Bag. 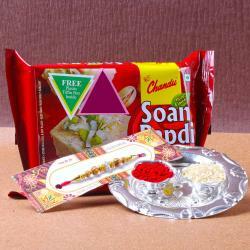 Raksha Bandhan is the festival in which sister uses to do aarti of brother with tying the rakhi on the wrist. 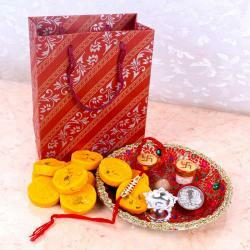 Attractive thali will surprise your brother with the elegant rakhi for it. Rakhi is the festivals which celebrate the eternal bonds between the siblings. Raksha Bandhan is a wonderful time to let your brother know how much you care. Rakhi treats your brother with amazing traditional Rakhi which is multiple hues, shades and its endearing design pattern. 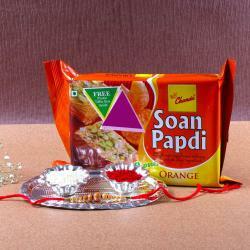 This also comes with Roli Chawal for the perfect mixture of festivity and tradition. 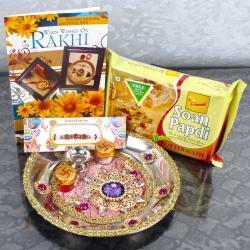 Rakhi is more special and heart warming for your darling brother. Rakhi is the most memorable occasion for all siblings. Rakhi which looks amaze and should definitely look fabulous. All sister use to tie rakhi after that offer a sweet dishes to brother so this thali combo is best with rakhi and Home Made Chocolate for your brother. 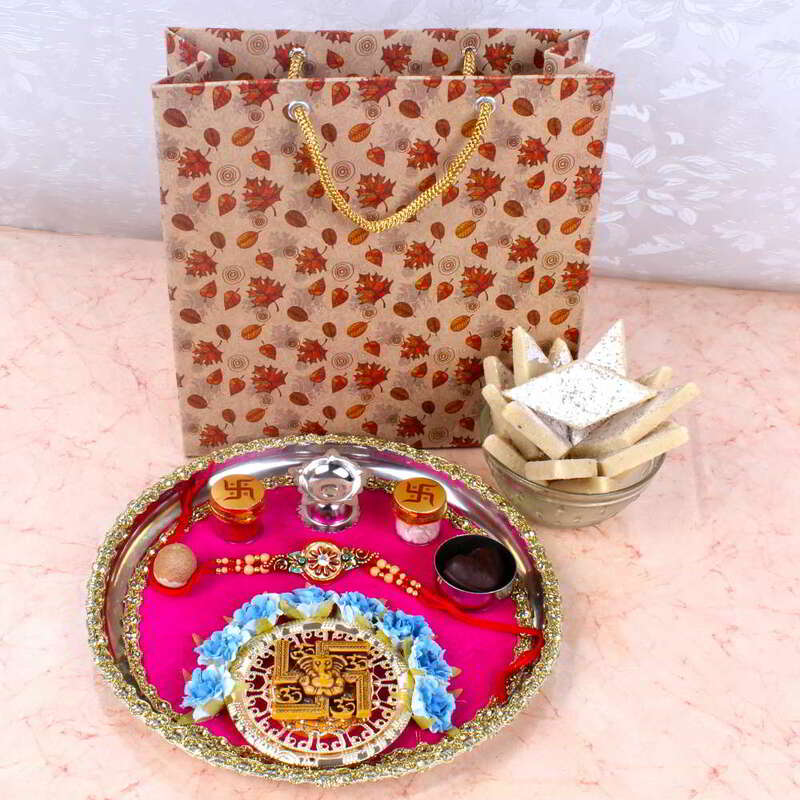 Rakhi Goodies Bag Includes : Decorative Stainless Steel Thali with Home Made Chocolate (Weight: 10 gms), Kaju Katli Sweet (Weight: 200 gms) and Traditional Rakhi with Roli Chawal.